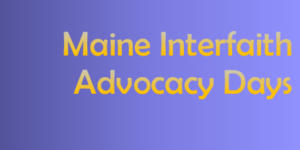 This two-day event is designed to bring people of all faiths together in our state capital to worship, learn, and advocate effectively with Maine’s legislators on the issues of immigration, poverty, health care, and climate justice. On the first day of the event, our Keynote speaker will be Rev. Jim Gertmenian, a retired UCC minister, well-known advocate for people experiencing homelessness, and a powerful voice for social justice issues. The Panel Discussion: “Mobilizing Faith Voices and Faith Votes,” moderated by John Hennessey,The Director of Maine Episcopal Network for Justice, will have panelists discuss ways that local congregations can support our democracy through voter registration and non-partisan voter education. The in-depth workshops that are scheduled will give participants the tools they need to become effective advocates who can articulate informed positions rooted in our faiths’ common social justice traditions. Participants register for two workshops (choose from Expanding Access to Healthcare, Childhood Poverty, The Opioid Crisis, Race and Immigration, and Caring for the Environment) led by policy experts and theologians in those fields. On day two, equipped with that information and inspiration, participants will spend time at the State House in Augusta speaking directly with their Representatives and Senators about pending legislation. Grounded in our shared traditions of justice, peace and the integrity of creation, we will strengthen our voices of faith and mobilize for action. Please join us in Augusta on March 19 and 20! Monday, March 19, 2017, 9:00 a.m.- 4:30 p.m.
Tuesday, March 20, 2017, 8:30 a.m. – 2:00 p.m.
We want to do all that we can to encourage participation of those who must travel long distances to Augusta, so we have set aside limited funds to assist with travel expenses, and we are helping to find local families willing to host overnight guests. This assistance is available on a first- come, first-served basis. Please contact Betsy Parsons, admin@muusan.org, 207-775- 0173, if you would like assistance with travel expenses and/or housing. We are also offering scholarships if the registration fee would pose an obstacle to participation. Registration fee includes a buffet style lunch (make-your-own salad and sandwich line that can accommodate most dietary needs) on Monday and a lunch voucher for the Cross Cafe in the Cross Office Building on Tuesday. Fee is not a charitable contribution and is not tax deductible. The future is arguably brightest for those that can re-imagine part-time pastorates as signs of emergent opportunities, not emblems of failure and imminent death. Convocation 2018 will provide an opportunity for you to name what’s been lost – reflecting on the shrinking professional class of full-time, ordained clergy. You’ll have more time to consider what’s been found – learning about mainline congregations experiencing heightened vitality through part-time pastoral leadership. Regional denominational leaders will join us to reflect on what they are observing in their settings, and how they are seeing creative energies being unleashed. Workshops will offer spaces for deeper engagement with other participants. The Rev. G. Jeffery MacDonald is an award-winning journalist and the author of Thieves in the Temple: The Christian Church and the Selling of the American Soul. He is also the pastor of First Parish Church of Newbury, UCC in Newbury, Massachusetts. The BTS Center awarded Jeff a 2016 Innovation Incubator Compass Grant to support his research on vitality in churches with part-time clergy.